It's been a quite busy month here at Yale, so I haven't been posting much. We hosted the Association for Japanese Literary Studies annual conference, using technology as the theme (we thus had a number of film-related papers). Now we have to work on publishing the proceedings. It was also midterms, but since Yale has no midterm break, everyone gets quite exhausted around this time of year. We did start our annual film series, however, sponsored by the Council on East Asian Studies, which these year focuses on off-beat jidaigeki. The first film was Vendetta at Sozenji Temple (Adauchi Sozenji baba), a dark but powerful work from 1957 by Makino Masahiro that features the clash of samurai and yakuza, and male and female values. We showed a 16mm print with English subtitles we got via the Japan Foundation. This week we will be showing Samurai Saga, a samurai version of Cyrano de Bergerac by Inagaki Hiroshi, and in two weeks, the superlative Brave Records of the Sanada Clan, a jidaigeki musical by the incomparable Kato Tai about the Sanada juyushi. I was sad to see that the great actor, Ikebe Ryo, passed away on October 8th at the age of 92. Ikebe was somewhat the intellectual, the son of a painter who graduated from the Literature Faculty of Rikkyo University. He originally entered the industry in 1941 to become a screenwriter, but soon switched to acting. His career, however, was put on hold by the war. He served in China and New Guinea, experiencing great hardship (most of his unit died in battle or of starvation and disease), and left the army at the rank of lieutenant. He returned to Toho and came to fame in the 1949 hit Aoi sanmyaku (Blue Mountains) playing a high schooler of all things--even though he was already over 30 at the time. It was first his youthful but serious good looks that ensured his stardom in the 1950s, as he appeared especially in a lot of literary adaptations (e.g., Botchan and Snow Country). He was also in a number of the Toho special effects films like Battle in Outer Space . He successfully extended his career by playing yakuza in the 1960s, starting with Shinoda's Pale Flower and continuing with many of the great ninkyo pictures at Toei. A very intelligent and principled man, he headed up the Nihon Eiga Haiyu Kyokai (an actor's union) and won major awards for his essays. His essays are well worth reading and he was a great man to listen to in person. 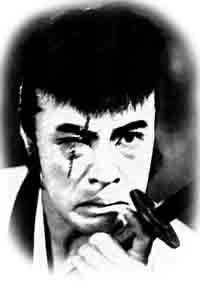 A colleague reminded me the other day that an article I wrote on Fukasaku Kinji was no longer on the net. The piece, which I originally wrote for New Cinema From Japan News, Vol. 2 (January 2000), printed in conjunction with a Fukasaku retrospective at the Rotterdam Film Festival, had been slightly revised and put online at Asian Film Connections along with some of my other work. (It also appeared in Japanese in Eiga kantoku Fukasaku Kinji no kiseki [Kinema Junpo, 2003]). When that site went private (without telling me, I might add), all my articles there disappeared. My colleague's inquiry has inspired me to return this article to the Internet. In Fukasaku Kinji's world, to begin a yakuza movie with the Bomb, as with Battles Without Honor and Humanity (Jingi naki tatakai, 1973), is not only to create a symbol of the nihilistic, nearly apocalyptic realm of corrupt, internecine struggles that will ensue, but to fix a historical marker that delineates the core of much of his work and makes him one of cinema's unique historiographers. The Bomb did not simply designate the first realization of nuclear horror, it prompted the end of the war and thus, to many of Fukasaku's generation (he was born in 1930), the total collapse of all the values - authority, nation, honor, etc. - they had been force-fed in school. For them, the explosive leveling of Japanese buildings and institutions meant less the end of the world than the thrilling opportunity to act in total, anarchic freedom while starting from scratch.